FILE - Workers process fillet from catfish in Ben Tre province, situated in the delta of the Mekong River in Vietnam. Vietnamese officials on Wednesday banned the processing or selling of dead seafood washed ashore or caught within 20 nautical miles of a mysterious mass fish kill along the country's central coast. The decree by Vietnam's agriculture and rural development agency sets guidelines for destroying possibly contaminated seafood but does not elaborate on measures to cope with violations. Vietnam has been investigating the massive fish die-off, which began nearly a month ago at aquatic farms and in waters off the country's four central provinces. State media have tied the event to alleged toxic discharges from a steel complex built by Taiwan's Formosa Plastics (TFP). In late April, TFP's local unit, Hung Nghiep Formosa Ha Tinh Steel Corp., issued a statement via its parent company saying there is no evidence that wastewater from its steel plant was responsible for the fish deaths. 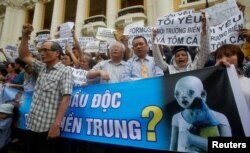 Hanoi officials, however, have said chemical toxins from human activities are responsible for the die-off, but establishing the exact source or cause of the toxins will take time. Wednesday's ban comes a day after Vietnam’s environmental and health ministries said seawater and seafood in four affected provinces met safety indicators. Demonstrators, holding signs to protest against Taiwanese enterprise Formosa Plastic and environmental-friendly messages, say they are demanding cleaner waters in the central regions after mass fish deaths in recent weeks, in Hanoi, Vietnam, May 1, 2016. Fears that tainted fish collected from the beaches are entering the country’s food supply sparked outrage on social media and waves of rare public demonstrations across Vietnam and in other Southeast Asian countries. Nguyen Thanh Huan, a consumer in Nghe An province who joined local protests, said his family and the surrounding community are scared and have decided not to consume fish, fish sauce or salt at this time. “The government has to work this out and compensate for the loss that we’re suffering," he said, referring to the many livelihoods affected by mass die-off. "They have to find ways to recover and revive the environment as well as strictly punish those responsible or those who are intentionally covering up the truth and extending our suffering. Vietnamese state media is reporting that dead fish are continuing to wash ashore on coastal provinces. On Tuesday, nearly 140,000 Vietnamese nationals signed a petition urging the Obama administration to launch an independent probe of the environmental disaster just weeks before he makes his first visit to Vietnam.